Blizzard Entertainment, a company that knows how to do gaming right (though not perfectly), has hit it big with their latest game Diablo III, launched in May of 2012. Within a week, they already sold 6.3 Million Copies, and as of September 2012, already made it to the Top Selling PC Games of all-time. Its success not only rides on the popularity of its predecessor Diablo II, but also stems from the utilization of a great amount of smart game mechanics to make users engaged and addicted. This article analyzes the techniques and game mechanics that Diablo III uses to achieve the status of Winning & Addicting. This is required for most games, and Blizzard is one of the best at it. Unfortunately, we won’t be learning too much from this because Gamification only applies to gaming elements that are still there after you strip out all the graphics, sound, action and apply them to professional activities. Pretty basic too. Pretty much all RPGs (Role Playing Games) have a leveling up system. When a player kills monsters, he gains Experience, which allows his character to level up and become stronger. A leveling system makes players feel that they are having progress and are improving themselves, even though the tasks they do are very mundane. A sense of improvement and accomplishment is key here. Again, like all RPGs, there is a storyline that makes players want to continue to play and find out what’s next. This is similar to wanting to finish a book or movie. Unfortunately, Diablo III’s storyline isn’t that great, and it makes you play through the same storyline in 4 different levels to beat the game (not to mention “farming” the same area/quests over and over), so this factor is not strong in Diablo. It does, however, get first-timers to want to finish the level 1 difficulty once. Besides leveling up, many games use the accumulation of points or currency to keep users actively engaged to it. While in Diablo 2, gold was useless, gold is extremely valuable in Diablo 3. Many players would log on everyday and play the game brainlessly just to accumulate more gold, and/or find very good gear that he could sell for more gold. This not only causes people to log on often (why waste hours on NOT accumulating more gold? ), but makes it VERY hard to quit the game. After all, I worked hard to accumulate so many points/gold in this game…it would all be wasted if I quit now. I better leverage it to my advantage instead! Like all online games now, Diablo III allows players to chat and play with their friends, as well as strangers on the same quest. This makes the game more engaging and interactive, and allows players to pressure their friends to play Diablo too. Adding “social” to websites is what really drove the Web 2.0 world, with companies like Youtube or Flickr being very successful just because of the social factors. Blizzard allows each player to see whenever their friends go online, as well as introduces a 1-click join to play with them. Oftentimes, when a player has played for a couple hours and is starting to get tired, he sees a good friend of his come online and decides to join this friend and play for another 2 hours. Interestingly, this creates some social pressure when someone wants to quit the game completely – it almost seems like you have decided to stop hanging out with your friends! One of the most successful gaming mechanics within games is something I call the Milestone Unlocks. When people play games, they often set an internal stop time in the form of a milestone – “Let me beat this boss and then I’m done.” “I’m close to leveling up, let me level up and I’ll stop.” What the Milestone Unlock does, is that it unlocks an exciting possibility that wasn’t there before once that milestone is hit. In Diablo III, whenever you level up you learn a new set of skills. These skills are awesome and generally help you kill monsters faster, with more style, or it would have made your earlier gameplay a lot easier. Once players level up (their “stop time”), they naturally want to see what these skills are, test them out a bit, test them out on stronger enemies, enjoy how powerful they are, and then realize they are so close to the next milestone that they might as well get there first. (This is when people plan to stop at 11PM but end up playing till 5AM in the morning). Another example would be, “I’ll go to bed once I check the Auction House.” And then BOOM, this player gets an amazing weapon in the auction house and he HAS to test it on some monsters and fully absorb his new sense of superiority. He’ll likely be thinking about it in bed too. One of the most successful iPhone/iPad games, Plants Vs Zombies (which I will cover in a later post), utilizes Milestone Unlocks to the extreme. When you complete each level, you will unlock a new Plant to help you defend against Zombies, AND oftentimes, that new plant is the exact plant that could make your life a lot easier on this stage you just beat! Of course you would want to start the next stage and try it out! Diablo III has a system where mentorship and guidance relationships can be created easily. The system is designed so that if you are a higher level character, you can easily help lower level characters beat quests, level up, and get better gear quicker. Being a mentor makes you feel fulfilled and important, while being an apprentice makes you feel that you got the easy way into progressing faster over others. With such a system, there automatically arises some sense of competition and envy (even before PvP is introduced). When you struggle at a quest for weeks, and then see your friend easily bust through it like its nothing, you aspire to be like that one day. Diablo III also allows players to look at each other’s gear, and when you see the legendary gear that they have, you want to go back and do the farming grind again. Seeing someone else win the jackpot certainly makes you want to gamble just a little bit more. Diablo 3 has a unique feature among RPG games – randomly generated maps and monsters. Every time you go to the same area or play the same quests, the experience is different. This allows continuous playing possible without adding more content. More importantly, whenever you kill monsters (especially tough ones), you get gears and items on the ground that is randomly generated. Gear is at the core of Diablo, and up until recently is the only way to become stronger and progress through the highest difficulty (called Inferno Mode) in Diablo 3 once you reach the max level of 60. People play the same quests in Diablo 3 over and over again (called “farming”) because they want to get better gear to make themselves strong enough for a higher difficulty. Technically, every few hours of game play should give players a good item that they could use or they could sell for a good price. That’s just enough to keep them motivated to play on. Gambling is the full essence of this game mechanic. You have 20-80 minutes of “okay, somewhat fun” experience, and then get a reward that makes you addicted and impatiently wait for the next reward to show up. I believe everyone is inherently creative, and desires to utilize that creativity. Unfortunately, not everyone’s life permits them to express that creativity regularly (you should try cooking). What Diablo 3 does very well is that it has 5 different character classes (such as Wizard or Barbarian), and each class has around 100 different skills. At any given time, a player can only choose 6 active skills and 3 passive skills, creating A LOT of combinations and what is referred to as “builds”. Each time you think up a new build, you need to find/buy the appropriate gear to maximize its effectiveness, which in itself could take some time in game play. The fulfilling factor is that every time you have a creative idea, you could test it out and get immediate feedback. There may be a quest that a player can’t beat. He then thinks up a better skill combination and then successfully overcomes it, just to hit the next group of monsters and lose again. This continuous process of solving problems, testing, improving and accomplishing is very fulfilling for each player, and it causes them to think about their strategies, research what others are doing through online forums, and analyze each move through Excel spreadsheets whenever they are NOT playing Diablo. The ability to get users to think about a game consistently and can’t wait to I back and test new things out is key to becoming a winning & addicting game (and yes, there are a great amount of “spreadsheet gamers” that do math often and tries to optimize their combinations and winning percentages). No game is flawless, and Diablo 3 certainly has its fair share of mistakes (note: just because users are complaining or whining doesn’t mean it’s a game design mistake. Sometimes the frustration, such as boundaries and limitations, is part of what makes a game good). Until recently, a Diablo 3 player could reach Level 60 by killing monsters and obtaining experience. However, after Level 60, the only progress that could be found is in finding better gear and finding better creative builds. However, if a player plays for a few hours and does not receive better gear(again, it’s randomly generated), it could be seriously frustrating and could feel like a waste of time. 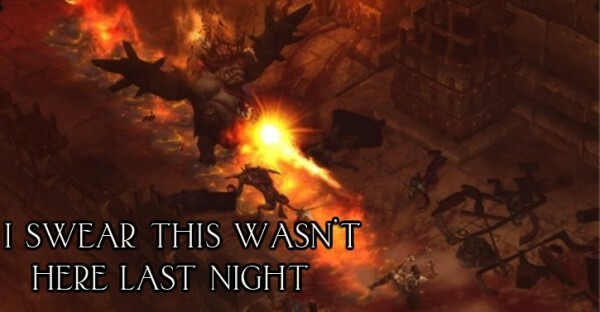 When I implied that Diablo 3 has limitless challenges, that’s only partially true. Due to user complaints (which again, isn’t necessarily bad), Blizzard has been drastically decreasing the difficulty of even the hardest levels, while making player skills much stronger (on top of paragon levels). This creates a problem as it eliminates the user’s desire to care. The only reason why you want to level up, get good gear, find better builds, is to be able to beat a more difficult level that you couldn’t earlier. Instead of having players “work” to accomplish the tasks, Blizzard opted to make the tasks easier, which could create a quick buzz of happy users initially (because now they could all resolve problems that were previously too difficult for them), but in the long run, users get used to this “easy game” and no longer have anything to fight for. You can now beat the final boss with semi-good gear that wasn’t possible earlier. Now what? There are no more incentives to farm and get even better gear after this point. Another big issue that Diablo 3 has, is that it has a relatively short storyline as well as smaller maps. In Diablo 2, a player could be playing for a much longer time and always feel lost in the big world with a huge variety of stages and places to explore. For Diablo 3, each act feels much smaller and quicker to finish. This quickly makes farming monotonous and eventually people feel tired of doing the same routine over and over again. Instead of just doing the regular “points” system and adding a leader board, there’s a lot more you could to your product and company culture to make it more interactive, fun, and challenging. Are you creating appropriate Milestone Unlocks to motivate people to continue? Are you introducing friendly competition and envy through a Peer/Mentorship Program? How about spiffying things up with some Randomness and a well managed Reward Loop Structure? And what do you do to inspire people’s creativity and sense of accomplishment? I would love to hear your examples of applying these principles into your work and your life. Are all “addictions” bad by definition or can some addictions be considered good? Empowerment of Creativity and Instant Feedback -> That’s how I got hooked on Darkorbit. Maybe one of the stronger point. Obviously a well crafted design is a must for any gamification campaign or any game for have any chance of success, but balance it’s a somewhat forgotten quality. Having 100 skills but that only a handful of them was really meaningful choices it’s a serious problem of balance. I believe that mechanics are nothing if they are not properly balanced, that could even damage the game. It’s like having a brand new motor installed in a car but not take the effort to tune and adjust it. I think that is what he’s referring to when he’s speaking to Blizzard making the game too easy. The balance is in making it challenging enough that I care, and easy enough that I don’t quit from frustration. I love the Diablo series, but in recently picking it back up to play with some new friends we played through the entire game without dying once. That’s just ridiculous. It makes it less interesting to play because I don’t have to care very much about the build or the gear because we’re already killing things so easily. maintenance savings in just a few years. Hello 🙂 I am interested to see the analysis for Diablo updated since they made core game changes in the recent expansion and patches. Supposedly, the changes introduced should address the initial set of weaknesses mentioned here. For example, capped development of a character should have been fixed by the paragon levelling system. Anyhow, good read. if you care and willing to go deep enough, i think, personally, that D3 is the best example that “twisted gamification” or other forms of focusing too much on simple incentives does not replace a overall good system. What are hundreds of skills worth if just few of them can be used effectively and/or, due to the irational NEED to “challenge” the player with difficulty together with the need to curb rewards, they all end up doing the same thing, the same way, just in a different color? What good is a leveling system, if, due to already mentioned reasons, you actually feel WEAKER the higher you are? It was probably wise for you to not start the game 😉 Although you always have a valid excuse as a gaming company CEO, hahaha. Great post! I’ll admit I was too scared to pick this game up myself, but this is a good recap analysis. I think we’ve unknowingly implemented milestone unlocks in Geomon, but we never put a label to the mechanic. And I think we could do more to further emphasize Mentorship, Competition and Envy. I’m impressed you were able to put the game down. Also, why aren’t you in the game space again…?